Wellington entertained second from bottom Hengrove at the Playing Field and ended their run of four successive defeats with a comfortable win on a pitch which had dried out well after the heavy rain of the previous days. Hengrove had lost their manager in the week and, with three players under suspension, were clearly struggling with popular Chairman, Mike Greatbanks, taking over the helm. Clive Jones had keeper Josh Mclean and defender Jack Bown-Porter back in his line-up with Mitch Woodgate moving to a central defensive role and Lewis Pocock and Scott Townsend on the bench. Joe Wylie, having previously shown good promise, was moved into a pocket behind the front-runners and displayed maturity beyond his years – finding space and making himself available and showing great awareness and deft touches on the ball. This was particularly evident in the early exchanges that saw Wellington move the ball about quickly and with purpose with Wylie and Josh Wadham combining well. In the sixth minute, Wadham played a good ball forward for Jack Bryant to chase into the box where Hengrove keeper Aaron Greatbanks brought him down as he tried to intercept. Wadham stepped up to convert the spot kick and put the home team on their way. 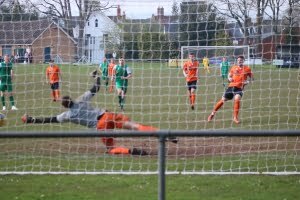 Two minutes later, a George Rogers free-kick found Jack Bryant beyond the far post and he struck the ball first time on the half-volley but Greatbanks brought off an equally good save to deny him. There was no respite, however, as Wylie set up Jack Bryant whose cross was met by brother Conor on the run to increase the lead. A mistimed header by Rogers presented Mark Fear with a chance for the visitors but he failed to take advantage and then the lively Ben Crewe sent a fierce shot over the crossbar. At the other end, Rogers cross provided an opportunity for Bown-Porter but his header went straight to the keeper before Conor Bryant made the game relatively safe with his second goal. A poor clearance by Greatbanks was headed back towards the box by Glen Wright where the centre-forward was left clear and he cleverly chipped the ball past the keeper. Hengrove came close to reducing the arrears when Mclean was caught out of his goal but the ever-reliable Tim Legg was on hand to head off the line. The second-half started with Wylie finding himself in space but he was just wide with a crisp shot and a quality cross from Wright found Bown-Porter whose firm header beat the keeper only to see it thump against the crossbar. After 55 minutes, following a corner, the ball found Sam Jones on the edge of the box and Greatbanks failed to hold his shot which gave the midfielder his second goal of the season. Shortly after, he was replaced by Sam Bryant, making a welcome return after a hamstring injury, as Wellington continued to press and Rogers made way for Scott Townsend. The home team’s short, slick passing had given way to playing longer balls and play became scrappy before Lewis Pocock replaced Wadham. A Jack Bryant cross found Pocock beyond the far post and he was unlucky to see his shot go wide before Wylie set up Conor Bryant who was denied his hat-trick by another fine save from Greatbanks who could do little to prevent Pocock netting his first goal for the senior side as his well-placed shot from the edge of the box which found the corner of the net to make the final score 5–0. A much-needed win for Welly who should have both Joe Chamberlain and Scott Drayton back in contention for the final home game of the season next Saturday against Bridport. Meanwhile Hengrove, who were promoted at the same time as Wellington and remain great friends, face probable relegation and hope to rebuild next season. The club wish them every success. 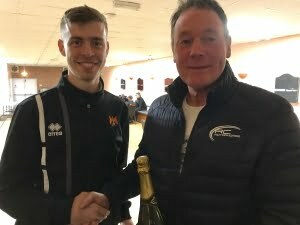 Man-of-the-match was Conor Bryant and the award was presented by Ian Nott.